The performance will start at 8:30pm in Nice, France. 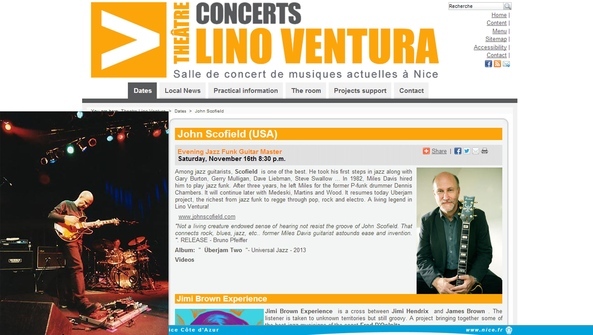 Among jazz guitarists, Scofield is one of the best. He took his first steps in jazz along with Gary Burton, Gerry Mulligan, Dave Liebman, Steve Swallow... In 1982, Miles Davis hired him to play jazz funk. After three years, he left Miles for the former P-funk drummer Dennis Chambers. It will continue later with Medeski, Martins and Wood. It resumes today Uberjam project, the richest from jazz funk to regge through pop, rock and electro. A living legend in Lino Ventura!